The all-new 2014 Mercedes-Benz CLA four-door Coupe is appealing to a new generation of buyers and Mercedes is marking the launch with a unique display in Paris. Mercedes is marking the launch of the new 2014 Mercedes CLA with a brilliant marketing campaign for which Mercedes-Benz will exploit the power of social media. Mercedes knows that the new CLA Class will targeting a new generation of buyers who have never purchased a Mercedes product before. In a very shrewd marketing move, the German automaker is marking the market launch of its new four-door coupe with an internationally unique exhibition of photographic art in Paris. How will Mercedes attract a new younger buyer with the display? Mercedes-Benz will get their new global buyers involved by having them use the social media Instagram. The digital photo installation #Untamed opened yesterday in a Mercedes-Benz pop-up store in the center of Paris, France. What better way to get their potential buyers involved than to display hundreds of personal photos taken by Instagram users from around the world. How does this reflect to new buyers what the new 2014 CLA Class is all about? The new campaign theme of “Untamed” is aimed at “breaking free of the constraints of convention to become the leader of the road-going pack.” Mercedes marketing activities will focus on the unconventional, self-assured and sporty image of the new 2014 CLA four-door coupe. The car is already unconventional with its sporty coupe-like look, and the CLA price point is aimed at capturing a whole new customer. Mercedes offers users the option to upload the three most creative and unusual pictures from their personal Instagram photo stream. They can then have them evaluated using the #Untamed Score. This indicates how unique the style of the pictures is compared with the pictures of other users. The choice of motif is completely free and participation is possible until April 10. If you are going to be in Paris, visitors will also be offered the opportunity of a test drive a new CLA, also at no cost, through the streets of the French capital. "We are absolutely thrilled by the creativity shown by internet users in interpreting the idea behind the online campaign", commented Anders Sundt Jensen, Head of Brand Communications for Mercedes-Benz Cars. The international online campaign #Untamed was launched on a special website by Mercedes-Benz in February. Mercedes has chosen a brilliant marketing campaign using Instagram that will appeal to the very generation of buyers they are trying to attract. The new 2014 Mercedes-Benz CLA will be available from authorized dealers starting April 13 in Europe. 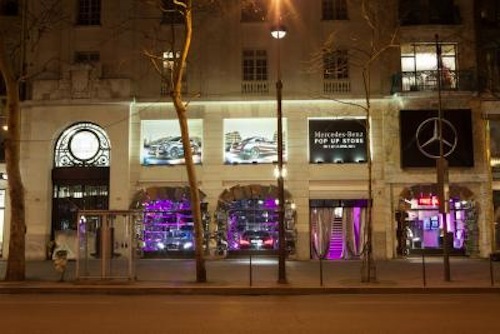 The new store in the heart of Paris invites visitors to a special Mercedes-Benz brand experience on four floors. The exhibition is open Monday through Saturday from 10 a.m. until 7 p.m. at the Mercedes-Benz pop-up store: 25 Boulevard des Capucines, Paris 75002.